For those of us who spend much of their day connected to the net, spam is part and parcel of the Information Age. We expect it on so many platforms that when we find a network where spam is seemingly limited, it jars you to find that network has finally succumbed. LinkedIn, to me at least, was one of those networks. It is extremely tempting: feeling as if everyone in the world wants to connect with us – because of how talented they think we are, or because there could be a potential job offer in the works – is a kind of vanity reserved for social networking. It becomes more tempting if you’re a small business and a connection could lead to a sale. Caveat emptor – your connection could actually turn out to be spam in sheep’s clothing. Let’s take my invitation by ‘Andrea Adams’ for example. From outside appearance she’s the connection most people want – attractive, serious looking, businessy (yes, that’s a net word). She looks professional enough, or at least her headshot does – she may have been in a shampoo commercial at one time. Alas, a headshot proves nothing. Click through to her profile and that’s where our new fan Andrea suddenly seems too good to be true. 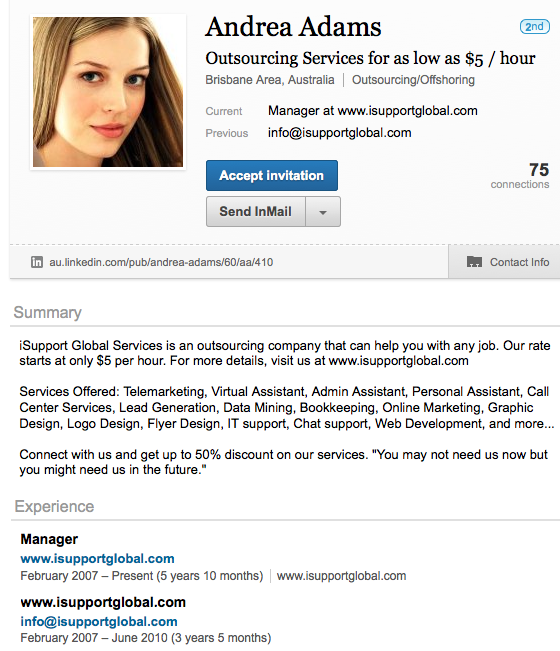 Her title is ‘Outsourcing Services for as low as $5 / hour’, which could mean anything – typing, midnight house calls or taco van cooking. Her summary is also fishy: It says absolutely nothing about herself. It spruiks how wonderful her employer is and all it can do – the phrase “Connect with us and get up to a 50% discount” gives it away. Want more? Andrea’s experience says nothing about what she does. It shows she is a manager, but of what? All you get is a link to the company website – an ‘all purpose’ IT services supplier based in the Philippines. My wonderful (and legit) LinkedIn connection Michele Smorgan volunteered to contact them to speak to ‘Andrea Adams’, but apparently Andrea was unavailable (though ‘Gen’ was more than happy to help). There are more things to look out for: When you click on the company profile, you are presented with four more profiles, each with the same information and experience (including one of Gen, presumably the only one who is real). While their profiles all indicate they are located in Australian locations (Melbourne, Perth and Brisbane), the contact numbers revert back to the Philippines. The problem with connecting with spam profiles is that they can make you look less professional – when your legitimate connections peruse your contacts and see a whole bunch of profiles lacking substance, they’ll wonder whether you take your LinkedIn presence seriously. If I’m wrong and Andrea is indeed a real person (I’d be happier knowing she was), my advice is still clear: Don’t blindly connect with every single person who asks. Check their profile first and see who else they are connected to. Google them to see if any additional information about them exists. Go the website they’ve provided and see if it is legit. And always remember – you don’t benefit by having the most connections; you benefit by the quality of the relationship with those connections.